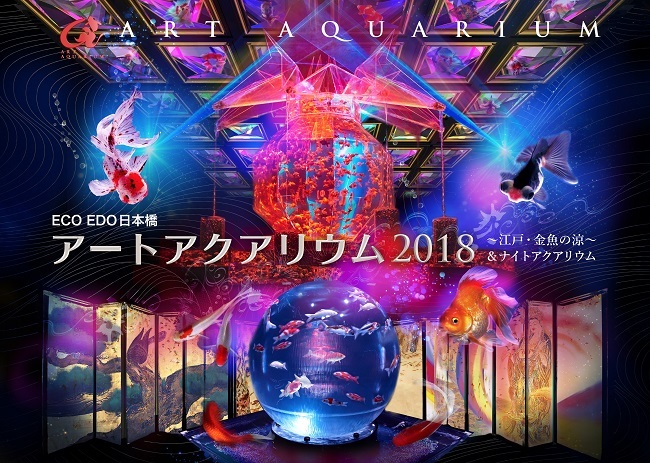 The “Art Aquarium” produced by a Japanese artist Hidetomo Kimura (read related article) is a delightful exhibition blending art, traditional crafts, design and entertainment. The brilliant show with installations using goldfish in illuminated aquariums has drawn millions of paying visitors over the years. For the 12th year, the exhibition will be held not only at Nihonbashi in Tokyo, but also in Nagoya and, for the first time, Shanghai in China. In Edo (premodern Tokyo), goldfish became popular among town dwellers as a symbol of summer. It felt like cooling off in the heat to look at goldfish swimming in a fish bowl. The coming exhibition will revive the old tradition in contemporary times, in a most amazing artistic setting. In 2018, with “a genuine Japan” as the theme, some 8,000 goldfish and Nishiki-goi or brocaded carp will swirl about in tanks of different shapes, sizes and materials exquisitely designed in the Japanese taste. “Byoburium”, an installation from past exhibitions for reference. A new installation will be on display at the Tokyo exhibition. In the evening after 7 pm, the glittering place transforms into a night lounge with DJs, live music and special shows, which include Japanese traditional performing arts such as Noh Theater, Kyogen, and dance by Geiko (details on the event website).